Defiance 2050 is a Sci-Fi action shooter MMO set in a post-apocalyptic San Francisco. Try saying that 5x fast. It’s also the next-gen remake of Defiance, yet another sci-fi MMO shooter that first released back in 2013 on PC, Xbox 360 and PlayStation 3. But if you’ve never had a chance to play the original game, yet something about it still sounds familiar, you’re likely recalling the TV show. Defiance was actually a companion game to the Syfy series of the same name. It lasted only three seasons before ending prematurely, however. Defiance 2050 introduces many quality of life updates to the 5-year-old series. We’re talking improved graphics and overhauls to the skills, loot and equipment systems. There are even two additional classes in the works! To kick things off, let’s talk graphics. Defiance 2050 got a relatively small but respectable facelift when it switched from 32 to 64 bit. And while the new look won’t be very distinguishable to the casual player, Defiance veterans will likely notice. They can expect cleaner colors, crisper images, and a more vibrant, beautiful game environment. It’s pleasant on the eye but as I said, it’s not a major change by any means. Defiance 2050 just looks like a shinier, newer version of its predecessor with better framerates. In contrast to the minor visual update, the skills system got a complete rework. The massive grid of unlockable skills is now gone, replaced by a much smaller class-specific skill tree. Gone are the days of each player being good at everything simply because they’re max level. Now, in Defiance 2050, gamers will need to consider their party member’s roles and their own load out much more carefully before heading into a fight. I love the change. It adds a level of diversity to Defiance that I never knew it needed. Furthermore, players are only given a finite amount of skill points to use. Even with the smaller, class-based skill trees, players can’t choose everything. This provides the opportunity for two Combat Medics to be rocking entirely different load outs than one another. As you might already know, the classes in 2050 have replaced Defiance’s old classless Origin system. While I personally think being an MMO with no defining class or role is something that makes the original Defiance unique, the new class system will take Defiance 2050 much further in the long run. This is based on economics, really. If Trion can keep introducing new classes and roles periodically in addition to other great content, it’ll keep the game fresh. Players will stay interested and continue playing for a long time to come. There are currently seven classes revealed: four base and three premium. I know “premium” is always a scary word in the world of gaming, but you don’t need to worry. Trion Worlds stated they built Defiance 2050 from the ground-up as a “complete free-to-play experience.” While we already know the base classes can be unlocked for free in-game, I would like to think the premium classes can be unlocked in a similar fashion. It might just be more difficult or more of a late game situation. Once classes are unlocked, however, players can swap between roles (even whilst in combat) and freely respec on the fly to fill any gaps needed in their group. Speaking of combat, one of the coolest changes is definitely the weapons. Not only can they be customized out the wazoo now, there’s even a new tier of weapon: Prototypes! With the creation of the brand new Enhancement System, weapons are a beast in terms of role-playing. Each gun you find has a randomized set of stats based on how rare it is and your character’s own Power Rating (think Gear Score in WoW). Power Rating is a new feature in Defiance and acts as a balancing element for loot, as well as a measure of how “strong” you are. The level of difficulty listed on maps and locations will actually go down as you increase your Power Rating. How awesome is that?! In addition to stats, weapons also have what’s called mastery bonuses, plus mods that can be equipped. Mastery bonuses are essentially percent increases to a gun’s stats that can be unlocked and rerolled. By increasing a gun’s mastery level you’ll eventually unlock its bonuses. Players increase a weapon’s mastery by expending a unique resource called “salvage.” Salvage can be collected by breaking down weapons you don’t want or need. It may also be found out in the wild, likely dropped from certain enemies or gathered at specific locations. It gets better though! The rarer the weapon, the more mastery bonuses that particular gun can have. It’s a pretty sweet feature if you ask me and when combined with randomized base stats and mods, enhancing weapons will easily become one of the best parts of Defiance 2050. There’s something for everyone in Defiance 2050. The multitude of classes and skills should appeal to the RPG fans. The Power Rating system will be a big help for casual players in regards to PvE. Then you have the Enhancement System which everyone should enjoy, but especially the veterans. They’ll be able to create their own customized arsenal and have a different bullet for every problem. Even console owners have a reason to rejoice with the PlayStation 4 and Xbox One versions. It’s definitely an improvement over the original and with so many quality of life updates, I suspect even the die-hard Defiance loyalists will come around eventually. We’re less than a week away from the July 10 release and it can’t get here soon enough. But if you honestly can’t wait that long, grab yourself a founder’s pack for as low as $19.99! They come loaded with in-game bonuses, such as additional classes, outfits, inventory slots annnnnd…a 3-DAY HEAD START!!! So kick off your Defiance 2050 journey in style by starting early and looking good. 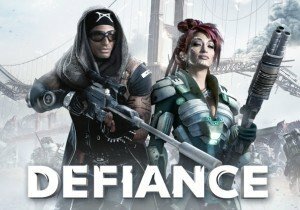 For those still unfamiliar with Defiance 2050 and would like to learn more, I encourage you to check out the Defiance Game Guide page, made by the devs themselves. It’ll clue you in on all things Defiance and help you better understand the world you’re playing in if you decide to pick-up the game. And of course, be sure to visit the official Defiance 2050 website for latest news and updates. Feel free to visit us too. Though I doubt we’ll see you much once the game releases.